FSX/P3D – Antwerp International Airport. Antwerp International Airport (ANR/EBAW) is a small international airport serving Antwerp, the second most populous city of Belgium. After two years work and taking over 2000 photos. This is the very first publicly available pixel accurate photoreal scenery for this airport. Featuring updated radio freqs (2017), accurate buildings and placement, custom AI Fokker 50 AI traffic, static SV-4Bs and SODE powered windsocks. It also comes with two hangars with accurate and accesible interiors completed by the inclusion of the neighbouring WW1 fort. Optimized for P3D, compatible with FSX SP2. airline´s hub for all flights. Includes Terminal maintenance hangars as company AEROMAN and American air base, Animated Jetways, 3D PAPI lights, Warning lights to Runway access Animated vehícles, Night ilumination in all airport, Photo real airport plane. FSX – Panama Tocument Airport. scenery of the Airport TOCUMEN International detailed that includes the northern extension of the terminal, Moving jetways and some catering service for your plane, Moving stairs at the South Ramp, Moving vehicles, Night lights over all scenery. FS2004 – Bethel Airport. Bethel PABE in southwest Alaska scenery. There is not much photographic information available for PABE, and I have never been there, and as there are no roads Google Earth street view has never been there either. As a result it was impossible to make detailed photographic textures for the buildings. However, I have made textures of the right colour for most of the buildings based on the information I assembled, so if a building is green with white trim then that is how it now appears here. The exceptions are the Alaska Airlines terminal building which has complicated curved elements, and the two military hangars and workshops. I had enough information to know that whatever I tried to make would only be a poor imitation of reality, so I settled for an Alaska terminal building from another airport and the same for the military. There are numerous small villages in the vicinity of Bethel, all of them being beside either a river tributary or the coast. There are two Google Earth screenshots to show the villages that are served by the flights from Bethel and that are (mostly) included in the AI. Some of these airfields were not included in FS9 but I have provided information so that AI will operate in and out of Bethel as if they really exist. The smaller area screenshot shows the villages that are close to Bethel, and of these eight I have so far made six and they are included in this post: Napaskiak PKA, Napakiak WNA, Kwethluk KWT, Atmautluak 4A2, Nunapitchuk 16A, and Kasigluk Z09. 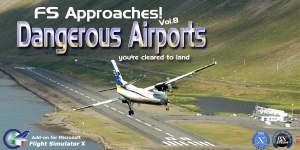 FSX – LFHC Perouges-Meximieux Airport. This airfield is located about 30 km north east of Lyon. The location has been checked and corrected by SBuilderX, Taxiways, car parks created with ADE. In order to make this scene more alive, I added the buildings (with Sketchup) some objects and people. FSX/P3D – Indira Gandhi International Airport (VIDP). Indira Gandhi International Airport (IATA: DEL, ICAO: VIDP) serves as the primary civilian aviation hub for the National Capital Region of Delhi, India. The airport, spread over an area of 5,106 acres (2,066 ha), is situated in Palam, 15 km (9.3 mi) south-west of the New Delhi railway station and 16 km (9.9 mi) from New Delhi city centre. FSX/P3D – Netaji Subhas Chandra Bose International Airport (VECC). Netaji Subhas Chandra Bose International Airport (IATA: CCU, ICAO: VECC) is an international airport located in Kolkata, West Bengal, India, serving the Kolkata metropolitan area. It is located approximately 17 kilometres (11 mi) from the city centre. The airport was earlier known as Dum Dum Airport before being renamed in 1995 after Netaji Subhas Chandra Bose, a prominent leader of the Indian independence movement. FSX – Tinker AFB/Oklahoma City (KTIK). This airport file adds parking to what was a barren airport. There is a mixture of combat parking spaces and combat cargo parking spaces. There are no new objects except some windsocks and the beacon tower has been moved in order to see it. If you have a previous version of KTIK installed, this file WILL replace it. So note that if you have this airport upgraded this file may not be for you.